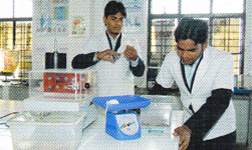 We have all the basic infrastructures needed for the practical training of all aspects of Pharmaceutical Technology. Our Machine room is equipped with necessary instruments for preparation and packaging of solid, liquids, semisolid dosage forms as well as parenterals. We have equipments like Tablet Punch Machine, Capsule filling machine, Mixers, blenders, grinders, homogeinizers, stability chambers, BOD incubators, Laminar flow work bench, Bottle and ampoule washers, Ampoule filling machine, collapsible tube filling machine, Magnetic stirrers and Centrifuges. In our laboratories we have all the essential instruments needed to evaluate the performance of the common dosage forms like Disintegration Testing Apparatus, Dissolution testing Apparatus, Friability testers, hardness testers. For the analysis of samples, we have additional Central Instrumentation laboratory containing all the sophisticated instruments needed for analysis. For training in various aspects of Physical Pharmacy, we have instruments like viscometers, stalagmometers, Microscopes with ocular and stage micrometer, Henderson pipettes, sieves, apparatus to evaluate ointments and pycnometer, . Our pharmacology labs are well equipped with instruments like actophotometer, rotarod, pole climbing apparatus, plethysmometer, student’s organ bath, autoanalyzer, microtome, homogeinizer, convulsiometer, analgesiometer. 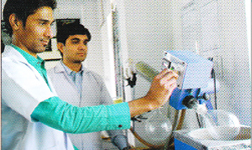 Our pharmacology students also take unrestricted advantage of our centralized instrument facility at RIPS itself, which contains various analytical instruments like HPLC, UV Vis specrophootometer, colorimeter and other instruments like Ultra centrifuge, high speed homogeinizer, high resolution microscope fitted with camera, BOD incubator etc. We have technical expertise and infrastructure to evaluate pharmacological activity of various compounds, drug delivery systems or natural products for antiulcer, anti-inflammatory and analgesic, hepatoprotective, immunomodulator, antihyperlipidemic, antidiabetic, antianxiety and antioxidant activities. 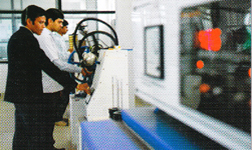 Our laboratory also has facilities for virtual training of the protocols by the means of compact discs and computers. In our Pharmacognosy Department we have all essential infrastructures for training students in various aspects of identification of crude drugs; extraction, isolation and purification of phytoactive compounds such as alkaloids, glycosides, essential oils etc. Our laboratories are equipped with Soxhlet’s apparatus, simple and compound microscopes, clavinger’s apparatus, separating funnels, camera lucida, muffle furnace, oven, TLC chambers and columns etc. For analysis of phytoconstituents, students can make use of additional sophisticated instrumentation facilities, where all important analytical instruments including UV-VIS spectrophotometer and HPLC are available. In our Pharmaceutical Chemistry Department, we have all the infrastructures and facilities necessary for training students in synthesis, characterization, estimation and analysis of drugs and impurities. We have melting point apparatus, UV-VIS spectrophotometer, HPLC, precision weighing balance, pH meters, filters, crucibles, muffle furnace, vacuum pumps, desiccators, reflux condensers, distillation assemblies, polarimeter, moisture balance, ovens, stirrers, shaker, fume hood etc. Our laboratories have running gas supplies for heating samples and water baths to maintain temperature. We have infrastructure to carry out tirimetric, colorimetric, spectroscopic and gravimetric analysis of various drugs.